What are .M4A files? AAC? ALAC? Difference b/w MP4, M4A & MP3? Which is better MP3 or M4A? & Why? There are different types of audio file formats available to store digital music data, you can read about them here. M4A (audio only MPEG-4 file) is used by Apple for unprotected music downloaded from their iTunes Music Store. Audio within the m4a file is typically encoded with AAC, although lossless ALAC may also be used. What is AAC & ALAC? Already explained in the previous article, read here. M4A stands for MPEG 4 Audio and is a filename extension used to represent audio files. Both .MP4 & .M4A are absolutely same container format, the reason for the existence of two different filename extensions is that the .M4A files are used to represent audio only MP4 files. Which is the best M4A media player? No doubt VLC media player can play it very well, that's the only media player that a user need these days. Quality: M4A files has better quality than MP3 files for same size. iTunes uses 256 Kbps VBR M4A normally. Size: M4A files have smaller size for same quality. 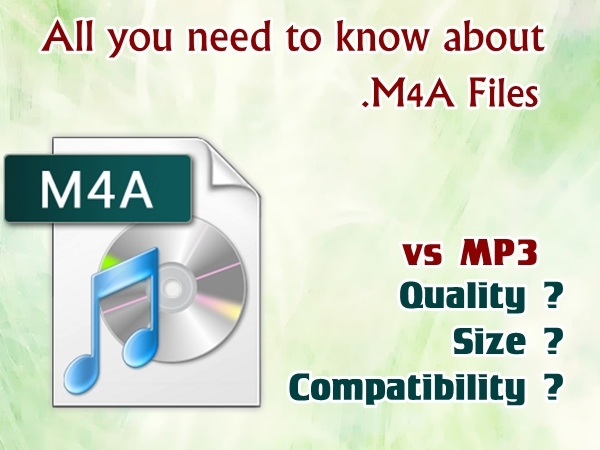 Compatibility: MP3 files are compatible with almost every device & media player, however M4A files are also very popular these day due to Apple iTunes & now almost all players that supports MP3 supports M4A too. In which format you should store/download music? If you want better quality for same size, go for M4A. Download iTunes M4A instead of 320Kbps MP3 as mostly website provides MP3 converted from iTunes M4A, so no logic in downloading converted MP3 file when you can download original iTunes M4A having same size. If your device suppoers M4A & you're still listening to MP3, it's time for you to move on. Any queries? You can ask in comments below.